Take a ride! A Summit® Stairlift will glide you effortlessly up and down the stairs. Life is good again! 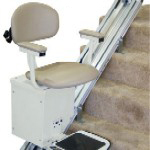 The Summit StairLift was designed for fast, easy installation! The hard part has already been done at the factory. This stairlift can be installed by a handyman! Noted for its secure support, the cable used on the drive system is aircraft cable which has been rated up to 4,200 lbs. Over 50 years of production on this product shows it can withstand the test of time. It's safety sensors do not allow the lift to run unless the seat is in the proper position. Safety sensors are also built into the footrest which will stop the lift if any obstacles are encountered. The Summit Stairlift boasts extra rigid armrests, a swiveling seat and an adjustable backrest. The backrest has three different settings, the fold up footrest adjusts to two different heights. The seat swivels 90° towards the landing at both the top of the stairs and the bottom to facilitate less bending, balancing and twisting as you get into and out of the lift seat. The wide, comfortable seat features thick padding and attractive upholstery. The control switch is conveniently located at the end of the armrest. Unlike other lift chairs, the Summit is available in two power options. Choose between safe, AC electrical Operation (low voltage, 24V controls), or add protection against power outages by using the DC battery operated system. Unlike other units, the DC battery operated unit continually recharges regardless of its position on the track. 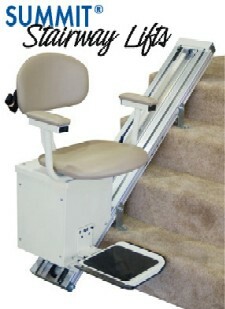 After ordering, we will contact you to complete the information needed to have your Summit Stairlift made just for you! Please supply us with a day time phone number where we can reach you. 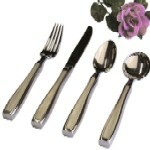 Or if you prefer, call us today to place your order at 1-888-833-8875. Shipping is $75.00 anywhere in the continental USA. Alaska and Hawaii residents please call to obtain accurate shipping rate information.